بازيابي اطلاعات پاك شده از روي سيم كارت...!!! با این برنامه اطلاعاتی که به صورت تصادفی از روی سیم شما پاک شده مثل Message و Contact برگردونده میشه ! Sim Card Data Recovery Software recovers your mobile phone sim card accidentally deleted text SMS messages. 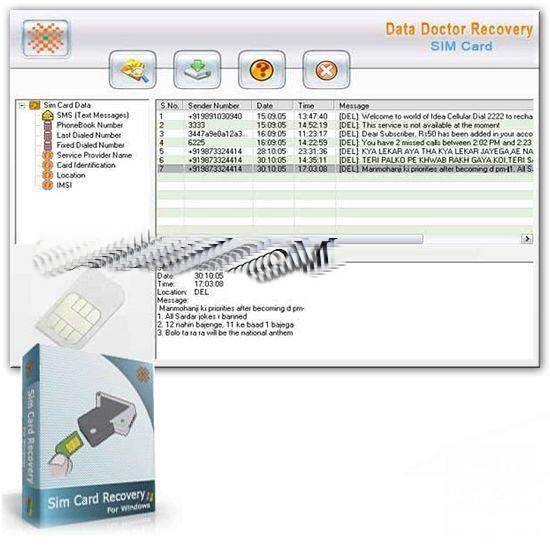 Data Doctor Sim Card Recovery Software is read only and non-destructive utility restore all lost message. Utility retrieve all deleted contact numbers (phone numbers), unreadable messages, corrupt phone book directory. It provides full backup of your cell phone’s erased sim memory. For recovery, you need a phoenix type USB sim card reader or PC/SC Standards based sim card Reader and a PC having Microsoft windows operating system. Sim card reader scans simcard deeply and detects all the recoverable information. Print option provides the facility to print report of all recovered data like your text message and contact numbers. This software provides full details about sim card like its provider and ICC –ID (identification number). It provides restoration of lost or corrupted text files due to virus infection in your mobile phone. Recovery is not possible if sim card is locked (due to unauthorized PIN code). Software ensures recovery even if your inbox, outbox, draft and sent items messages and phone numbers are invisible or unreadable. It fetches recently erased call list. - Tool Support recovery on windows XP, 2003, XP Media Center2005, Longhorn, Vista, 2000, NT, ME and 98. - It is Read only and Non- Destructive sim card data recovery utility. - Print option provides recovered data on paper in text format. - Software also shows the provider name and ICC identification number of sim card. - Utility provides full backup of corrupt or damaged sim card memory.